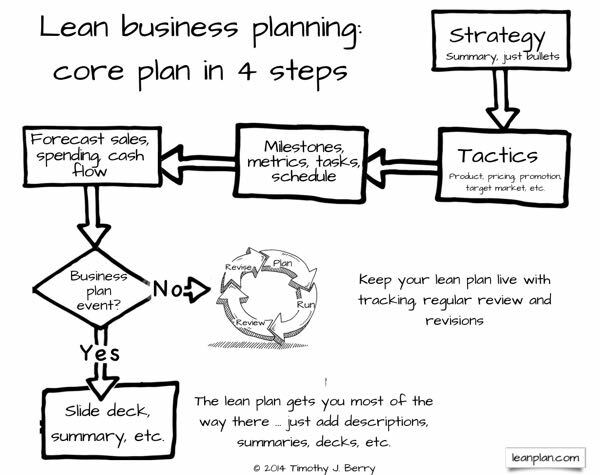 The lean business plan is developed by and for the people who execute it, not to be shown to outsiders. It’s just lists and tables, not text. It’s for you and your team. Define strategy. Use any framework you want. This is not finished text, just bullet-point reminders that keep you focused. It’s something you and your team refer to as a reminder. Set tactics to execute strategy. Tactics include pricing, distribution, product versions and configurations, launches, social media, working capital, and so forth. Keep them with simple bullets, and make sure the tactics match the strategy. Develop the concrete specifics. List your assumptions. Set major milestones you work towards, like the new product, the new store, hiring that key person, getting to 100 customers, getting 1,000 likes, or whatever. Set the metrics, which are the measurements you track, like sales, costs, expenses, and units, traffic, events, output, conversion rates, etc. Define how you will track progress. Determine your essential numbers. Good management takes forecasting so you can track and manage results. At the very least, have a sales forecast, spending budget and cash flow. What about market, market analysis and market research? Planning without knowing your market is dumb. Do whatever it takes to know your market. But you don’t have to add market information into your lean plan if you and your team know the market and don’t need to prove it to yourselves. If you need market research, do it. Every well-run business has a planning process that sets aside an hour or two per month to review progress towards goals, identify problems and opportunities, and revise strategy, tactics, milestones and budgets as needed. I write this not just as an expert in planning but as an entrepreneur who took my own business past $5 million annual sales without outside investment. 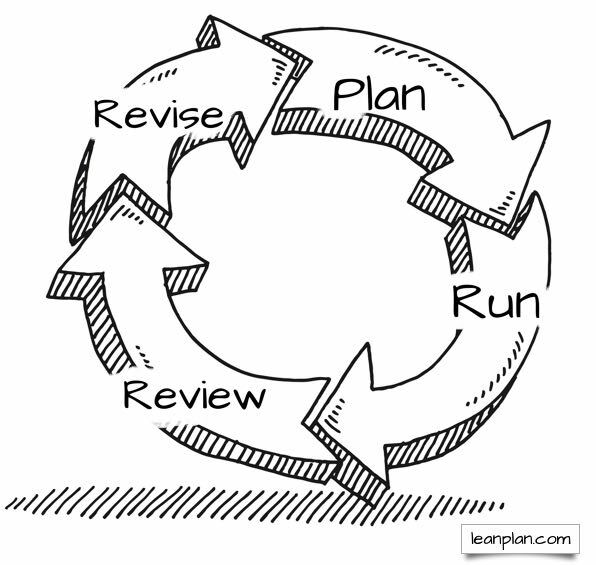 The key was a monthly meeting to review actual results, compare them to the plan, and revise as necessary. All business plans are wrong. The management value isn’t whether we accurately predicted the future, but rather how what really happened differed from what we expected, which leads us to management decisions about what to revise and what comes next. The value of a business plan is the decisions (the management) it causes. For that, lean business planning is perfect. It’s a planning process, not just a plan.